Don’t let the casualness of the dining fool you: burgers are serious business. If you need evidence, look no further than BLT Burger – the new sister outlet of BLT Steak. They have Christophe Bellanca, former head chef of New York’s La Cirque, to open this place and flip burgers. But don’t get the wrong impression: these aren’t necessarily gourmet burgers, but BLT classics from their New York and Las Vegas outlets such as the ’BLT’, ’Tex-Mex’, and ’The Stripper’ (bunless). US Angus beef is used in the patty, and not much else from what we could tell; the meat crumbles when you eat it, showing that it’s superior ground. 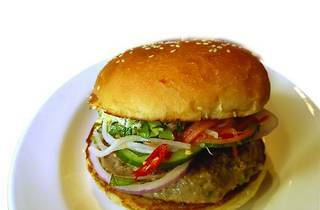 The sesame bun, however, is nothing special. It gets fed in the automatic bun-toasting contraption and auto-buttered at the same time, but no matter how skillfully toasted or evenly buttered, it’s still the same white bread you get anywhere else. Prices range from $78 for the classic burger to $118 for Wagyu. There are lots of non-burger options here too, our favourite being the batter-fried dill pickles with ranch dip ($50). There is a school of thought that says anything deep fried tastes better, and such is the case with these pickles. Excessive, yes, but the acidic-sour taste of the pickles cuts right through the grease. Other noteworthy deep-fried items were the sweet potato fries (soft on the inside, audibly crunchy on the outside, $42), the waffle-cut fries with sour cream, bacon, and jalapenos (well-seasoned and packing a punch, $60) and onion rings (thick-cut, best eaten naked, $42). 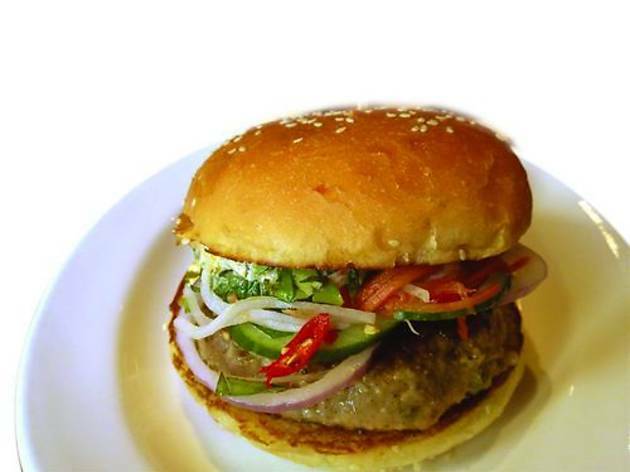 But the most surprising item, and perhaps the best, was the báhn mì burger ($78). This is a salute to the Vietnamese sandwich that has gained cult fame in New York. This well-seasoned pork and shrimp patty had a spring to it. Loaded with carrots, pickled daikon, and sriracha-tinged mayo, this burger might be a bastardised version of the mystery meat sandwich, but it sure is a tasty one. Shop 301, 3/F, Ocean Terminal, Tsim Sha Tsui, 2730 2338. Daily 11am-11pm. Meal for two: around $350.